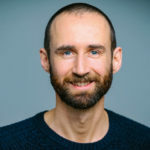 Wearables, telemedicine, mobile apps, data sharing, online information search – 7 key conclusions from Rock Health Digital Health Adoption Consumer Survey. 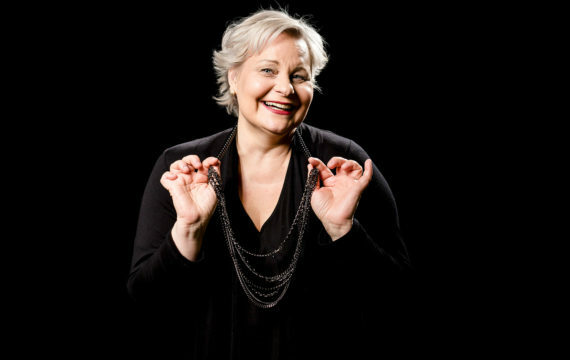 Only 11% of patients with high blood pressure track their health goals vs. 56% of obese patients track their physical activity. 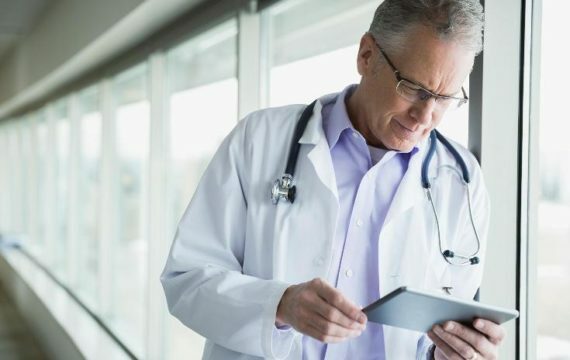 In the last three years there is a clear upward trend of consumers taking control of their healthcare via the use of digital tools like telemedicine, wearables, and online provider reviews. 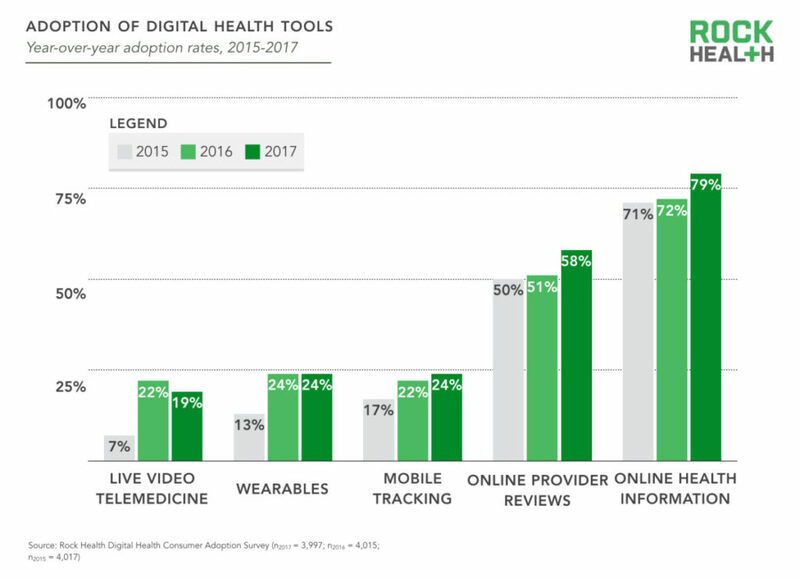 The percentage of respondents adopting at least one digital health tool increased from 80% in 2015 to 87% in 2017. 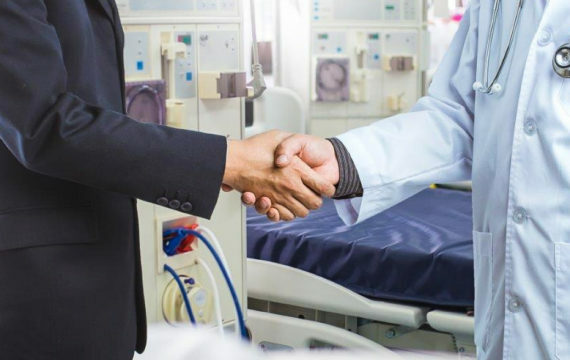 Survey respondents – whether using wearables, digital health tracking apps, or telemedicine – reported that they got what they were hoping for from the experience. 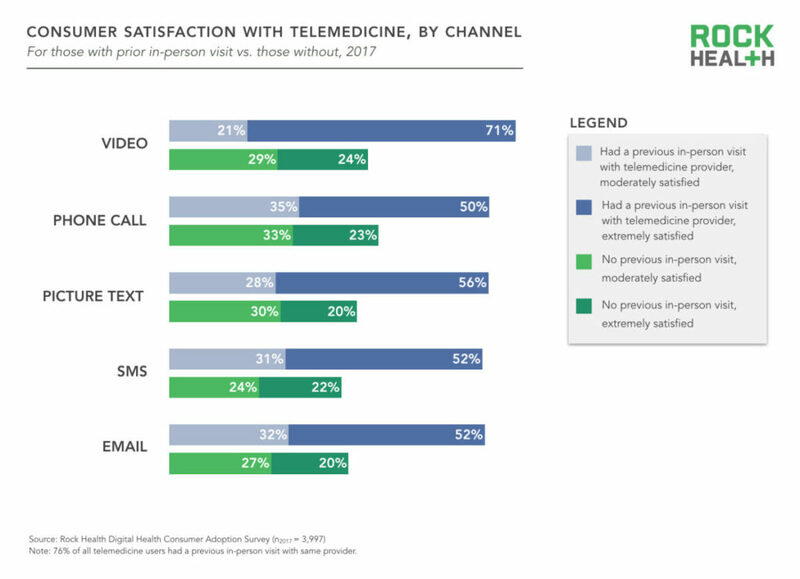 Those who have used live video telemedicine are satisfied with it – particularly if they paid out of pocket. 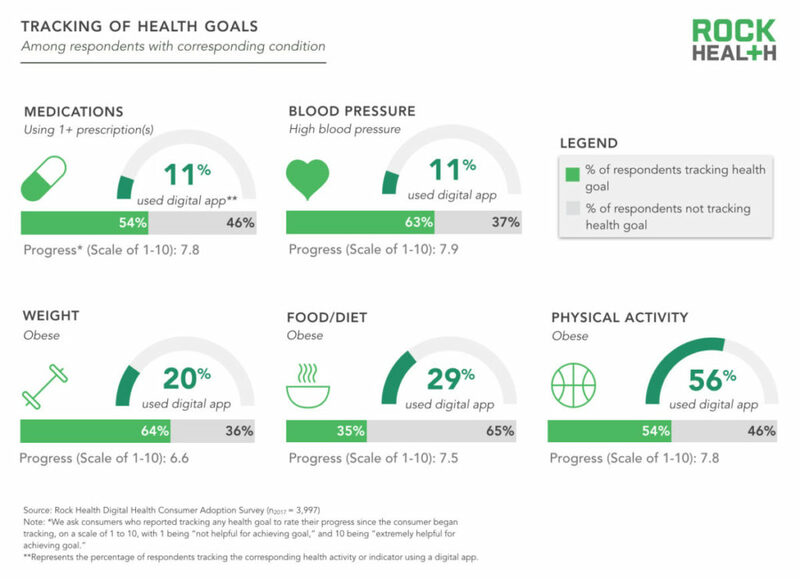 Respondents who tracked various health goals – weight, physical activity, sleep, medication adherence – via digital apps and wearables reported making progress on or otherwise achieving their health goals. 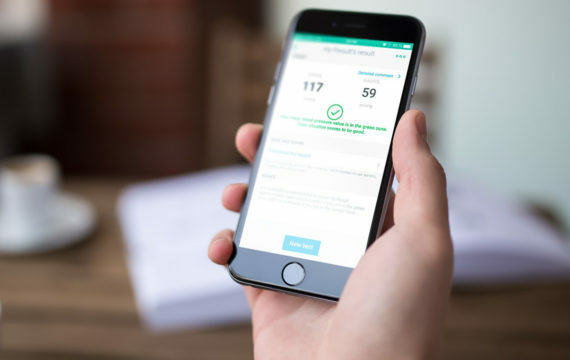 Respondents taking medication and those with high blood pressure are likelier than not to track a related health goal; but a minority of these groups use a digital solution to do so. 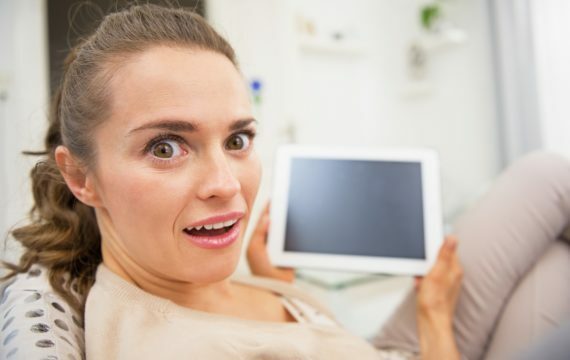 Of those respondents tracking their blood pressure, only 11% do so with a digital app/journal. 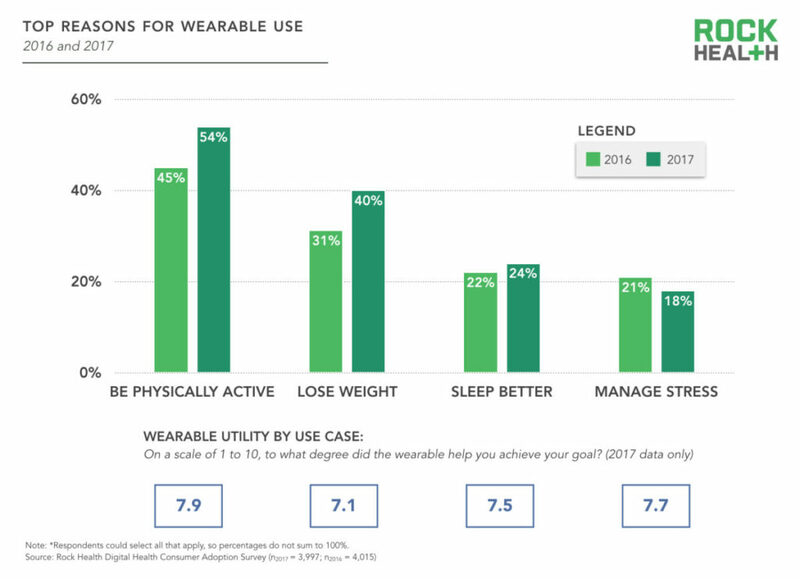 Among the 24% of respondents that own a wearable device or smart watch, over a quarter reported that they no longer use the wearable. 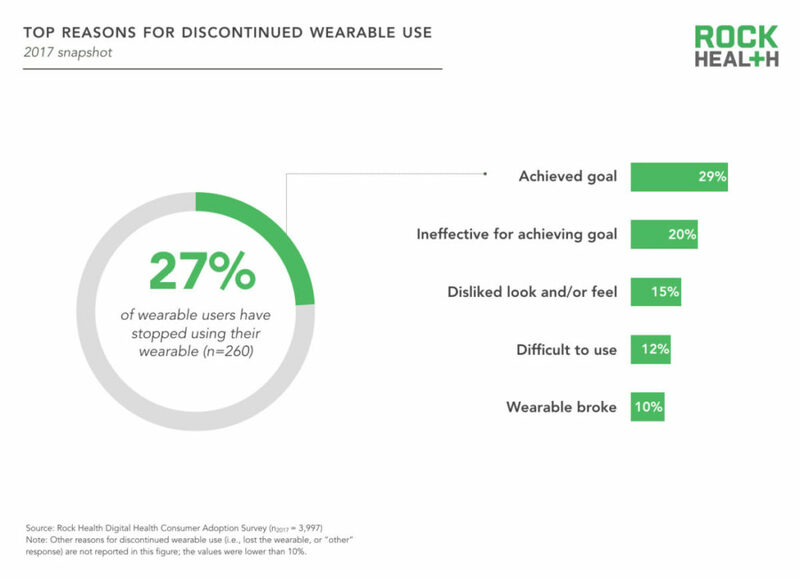 Nearly 30% of users discontinued use after achieving their intended goal, while 20% stopped use because the wearable was ineffective in helping them achieve their goal. 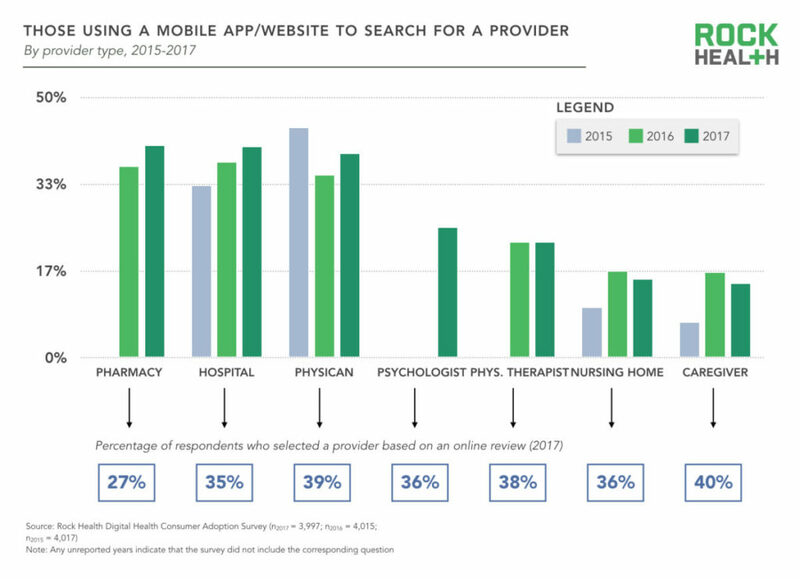 58% of respondents have, at some point in their lifetime, searched for an online review of a provider. This is an increase from 50% in 2015, with the boost largely coming from increases in searches for pharmacies and hospitals. 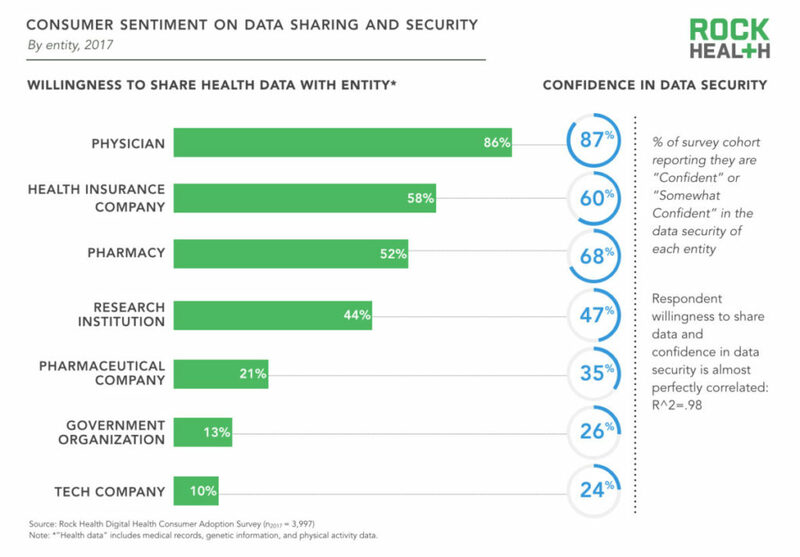 Respondent confidence in data security of tech companies declined from 31% in 2016 to 24% in 2017. 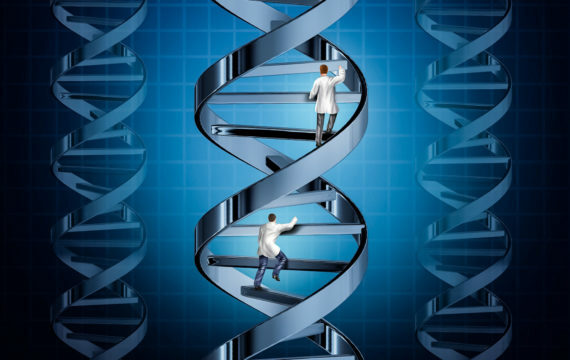 Though most respondents are willing to share health data with their physician, there is a significant drop-off in willingness to share with other stakeholders. 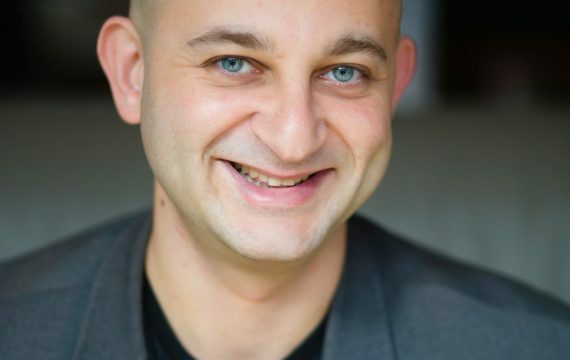 92% of respondents with a prior in-person visit were satisfied with their video visit compared to 53% satisfaction among those without a prior in-person visit.